One fledgling vampire. One nearly powerless witch. Two underdogs in society. Will a chance encounter between two should-be enemies lead to anything but violence? Until three weeks ago, Dorian was a human - one of those subjugated by the supernatural beings who now rule the world. He spent 10 years struggling to survive, but now that he's been turned, he needs to learn how to live. Problem is, there's a lot to learn but not much time to learn it in. Loneliness is far from the only problem, but it seems to be the most pressing. Supernatural or not, Emery doesn't have a fancy family name to back up his standing in society. The most memorable thing about him is his red hair, not his magic, and he's had to throw in with those whose price for protection isn't low. Even though he'd never admit he's lonely, he's fascinated enough by his run-in with a brand-new vampire to not dismiss him despite the tensions between their races. Asymmetry, Spoiled* and Anticipation*, the Need Trilogy, the Tamed & Trained Trilogy**, the Fate of the Fallen series, and Gifts can all be read separately from each other. Though they are all set in the same universe and there is occasional crossover, the timeline is ambiguous, and there are minimal spoilers across the books. I love this book I could read and now listen to it all the time. I love how Dorian and Emery come together even though they shouldn't. It's a great, easy introduction to the Fate of the Fallen series. Kenneth Obi always does amazing narration. He brings the characters to life. This one was sweeter than the others but the tension was still there. The beautiful writing and the way the narrator captured it perfectly. I was captivated. This was such a well written novella, a unique take on boy meets boy from the wrong side of town story. Both Dorian and Emery are young and full of longing for something other than mere survival. 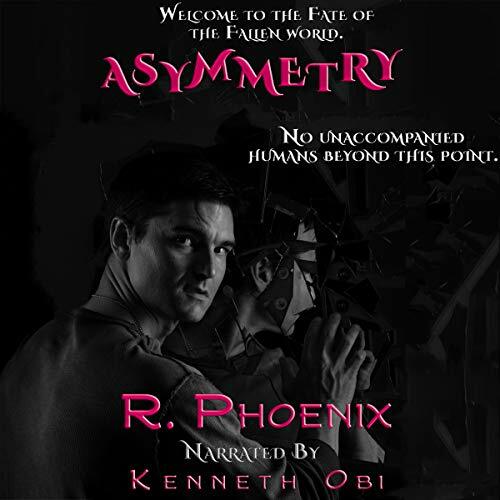 I have read all the stories set in the Fate of the Fallen world and Asymmetry shows a different, a kinder and sweeter side of this dark and cruel world. The narration was very good and fit the story perfectly. 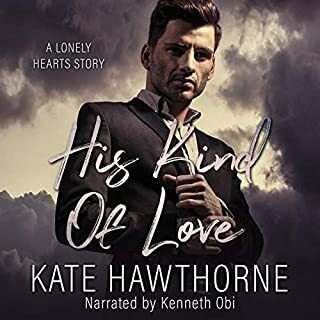 I recommend this audiobook to readers who enjoy paranormal romance and like a great story. Dorian and Emery's first encounter had me chuckling a lot. This was such an engaging and entertaining read of possible foes to lovers and I found it enthralling. I loved watching this sweet odd relationship develop. I look forward to more in this series. I loved rhe narrator's expressive voice. I listened to this one in one day,the sweetness to it was a pleasant surprise and I hope to hear more from them. I love the world the author built for this series. I just really loved these characters so much. I found myself smiling at all of their interactions. In a world where they are really supposed to be enemies at the least, and fully hate each other at the most, how do a Witch and a Vampire form such and instant connection and bond like they do. They are both such cute characters, I could read more of their story for hours on end and not get sick of either of them. Dorian, is a newly made Vampire trying to figure out his place in his new life, while trying not to eat everyone in sight. Emery the (Kind-of) Witch with very limited powers doesn’t know why he is so intrigued and drawn to Dorian after their first encounter. But he ends up following Dorian to see why they have the instant connection they do. Gawwwdd... This book was great. Seriously, everyone should read it. And while you’re at it… Get it in Audio too. 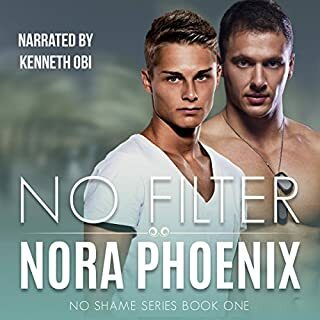 Audio – Kenneth did a great job making me fall in love with these characters even more than I already did. He totally gave us the perfect narration and voices to make these characters and their personality traits come across completely in this narration. I loved every minute of this one, and could listen to it over and over again. I loved this one so much. It such a short story but so sweet and fun. The narrator made a wonderful job. I loved the way he give voice to this lovely characters. It was an unusually sweet story in this dark world. I loved the way both characters were portray by the narrator, but there was something so right about Emery’s voice that I just could see him there with his beautiful hair talking that way. It was amazing. I also loved the brief moment Dorian’s sire was on scene, he had the most beautiful voice. I was hoping for him to be there a little longer because he had such an impressive presence that demand to be noticed. I loved him. It was so well done from the narrator that I’m feeling encourage to listen to more of his job. The story itself is wonderful. I loved Emery so much, he’s such a lovely character. He and Dorian made a great couple. Sure, I can’t said they feel like they were in love, they had just meet and I don’t really like insta-love so, in that matter I was happy the book wasn’t trying to force the readers to believe this two are in love, but they surely are in the way to be. Overall a very sweet and fun short story. This is such a sweet story and to have Kenneth Obi narration just makes in even better. Dorian and Emery shouldn't work but are just amazing together. I love every thing about this book. Having R. Phoenix and Kenneth Obi together just makes an amazing listen. This story was a lot sweeter than some of Pheonix's other stuff in the Fate of the Falken but no less enjoyable! I really liked the sweet coupling of a witch and a vampire, two that are supposed to be enemies but click all the same. And you get to hear a little more about the world came to be with the supernatural taking over in the beginning. I enjoyed this super short story set in a dark world of witches, vampires and other paranormal entities. Emery and Dorian meet where one of them is not supposed to be. One Witch, one Vampire are drawn to each other in this tale of love in the darkest of places. 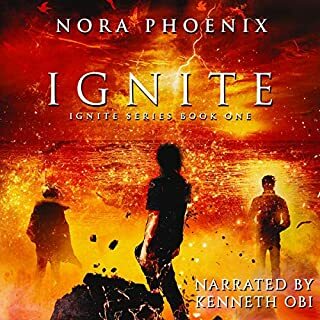 Kenneth Obi did a great job with the narration. This was, within a gritty world where witches, werewolves and vampires have taken over, a surprisingly sweet and rather charming novella. The story revolves around Dorian, a new vampire, and Emery, a sort-of witch, both who are trying to navigate a new humanity with their own struggles, but who end up in a rather gentle togetherness. 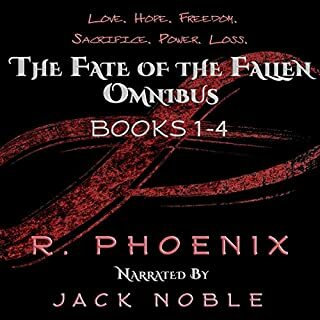 A nice short intro to the Fate of the Fallen world - with great narration. It is was nice to listen to a book from the fate of the fallen era that was sweet, yes I headed the warning and not expecting the others to be like this. I am beginning to have a love hate relationship with R.Phoenix’s books as they tend to leave me with nightmares. But this book was a good insight into her world without the need for Valium. I want to know more and wish the book was longer!!! Hoping we see more of these characters and whether they are accepted by each other’s people.